Certainly every company does have some form of funnel, so it can whittle down the host of ideas into that final concept that eventually becomes commercialised and released into the market. I don’t want to get into the specifics of stage-gates, how many, why these have certain assigned hurdle rates, why they are equally loved and hated etc., etc. That is fuel for a later blog perhaps. The funnel is always depicted as easier than the real thing, the activities that goes on daily in each company working through the idea to final concept. Taking ideas to commercialisation is an awful lot of hard work. The worry and constant complaint is, that irrespective of our generating “thousands of ideas,” we still only seem to get between 5 to 10% success rate. This low success rate is what you seem to hear more about than anything else laying the blame on innovation, why? Maybe because our view of the funnel is wrong? Maybe because we are not listening and appreciating both sides of the funnel? Again this is seen set in the ‘classic’ traditional way, but with a real touch of Tom’s great humour. He also capture it well in that any idea entering the funnel is facing a ‘death of a thousand cuts’. 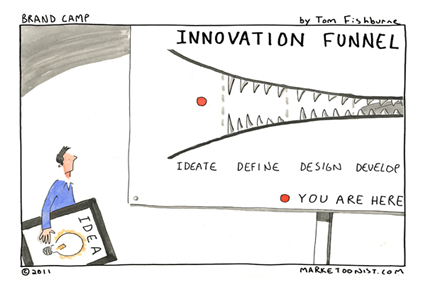 The jaws of a hungry alligator realy to devour all (ideas) that enter the funnel. He implies that the funnel has got a certain reputation as something ready to constantly digest its next prey. But does it need to be like that? The Innovation Funnel Actually Has Two Distinct Sides. The Left Side is the one often not deeply appreciated as the really critical one and the side we often spend less focal time upon. “Before anything else, preparation is the key to success”. Really mastering this side of the funnel, allows for the potential for better ideas/ concepts to move through the complete funnel. This is the raw end, the side that really is the hardest part, the often really, really, fuzzy part. This is the place mostly lying outside your organization’s domain of knowledge where the ‘real world’ functions and where you really need to constantly search and scan the horizon for possible ‘breaking opportunity or posibility, not just ideas that you think might fit from within your own world but ones that alter that world. 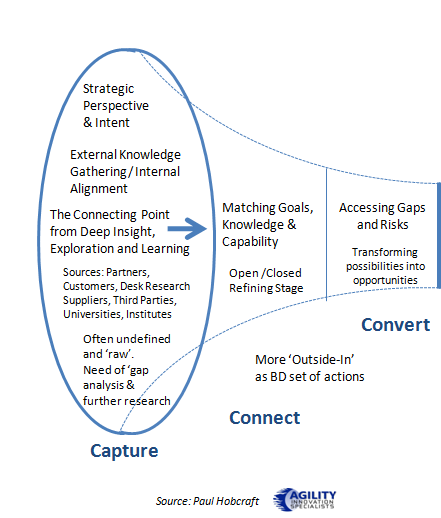 What do you need to capture within the left side of the funnel? 1). Firstly, this is where innovation and your strategy need to get good alignment. Having a clear perspective of what you need to focus upon is going to get you far quicker to spotting possible opportunities. It helps you to have a ‘reasonable’ understanding of intent, of capabilities, of potential to take this ‘raw material’ and convert it into a tangible set of ideas or concepts. 2) The External Knowledge gathering and Internal Alignment need to keep working these ‘nuggets’ of raw opportunities, realting them, exploring them, turning them over in your mind, in your thinking about possibilities and seeking different points of alignment. 3) The connecting points come from the deeper set of insights you have about your markets, your customers and their unmet needs and your capacities to translate these through exploring any potential from the ‘raw material’ and the degree’s of learning that comes with this, to convert it into something value and eventually commercial. 4) Knowing where to go as sources of knowledge is becoming more critical. These can be through existing partners, through university connections, collaborations with competitors, institutes or by completing your own desk research offers you a wealth of places to explore. Simply observation in different markets, in-use studies or travelling in different countries and absorbing different insights and experiences provides the ‘scout’ the capture points. The key is being alert to ‘seeing possibility’ but at the same time ‘being aware’. 5) Once you have some raw concepts or ideas they will need some testing against. Not just can this be translated into a finished product that gives us value but does it map back to your research, your internal understanding of market/ customer and their needs. To sell any raw thinking back into a company you need to make it relevant, it needs to connect, and it needs context. 2) Also a preliminary assessment of if this can be managed and where it is going to be developed; purely internally (closed innovation) or do you need to have a collaboration with external partners (open innovation) or equally, the raw thinking was already found through a collaboration and you need to build the justification to take this further, in agreements, resourcing etc. 3) Many organizations are looking beyond raw thinking and deliberately searching for concepts already part-baked or proven concepts that can be ramped up or scaled quickly or just needing the additional expertise your organization can bring into the mix. This is the better known and discussed part of the funnel. I will not go into that so much on this side, this is well discussed and debated by many. I just offer a few thoughts. The crucial difference lies in listening and interpretation of the inflow from the left side. By working through the left side of the funnel you have refined much more. What is entering the funnel is arguable not needing the traditional wide-neck funnel; it actually becomes the narrow part. It is then a real need to widen out these as the concept takes hold and has resource taking these up and exploring the idea and working through the concept to turn it into final offerings or multiple ones for release into the world. The generation of thousand of ideas becomes a misnomer as applied here. Ideas were evaluated well before they entered the commercialisation process (the right side of the funnel). The critical thing here is they need to meet your portfolio aspirations and goals, any concepts need to ‘fit’. 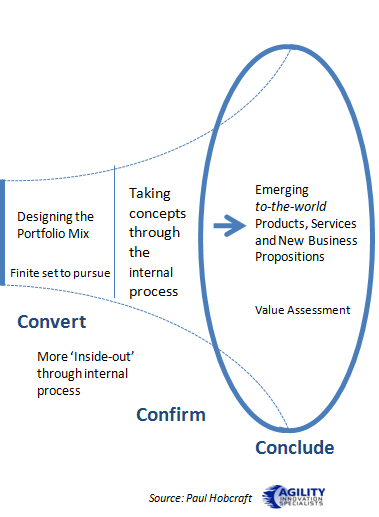 Fit not just a portfolio but the strategic goals, the product intent, the market and customer needs. This is the point you start really testing and refining inside the organization. Stop just ideas simply entering your commercilaization part of the funnel, it wastes precious resource and dilutes energy, better spent on focusing on the real few valuable potentials moving across into the right side of the funnel. We come back to the stages you take a concept through; it could look like this, based again on the stage-gate approach. Where I do feel all the efforts made that get a raw opportunity into a concept and through often a highly structured and laborious internal system often misses the critical execution stage. Some even offer the view execution can be the harder part; it is where all the hard work meets market and customer reality. The ability to execute an innovation initiative sometimes interrupts the ongoing business. Execution is an area that Chris Trimble and Vijay Govindarajan have written about in their book ‘The Other Side of Innovation- Solving the Execution Challenge.” It is worth reading to understand this final part of any innovation introduction, it brings execution into its appropriate place, the realities of the market place and where (innovation) rubber really does hit the road. So for me, the present thinking of the innovation funnel needs to be extended back, back before the classic ‘ideas’ of people gathered in brainstorming sessions or simply using idea management software to explore mostly random thoughts that often do not translate. You need to start with a strategic perspective and define your intent, your intent to look for ‘targeted’ ideas and raw opportunities not the ones randomly offered in idea generation sessions. Start at the beginning and not as we seem to do, in the middle. Simply ‘ideas’ entering the funnel is a myth, it is far too simplistic a view. 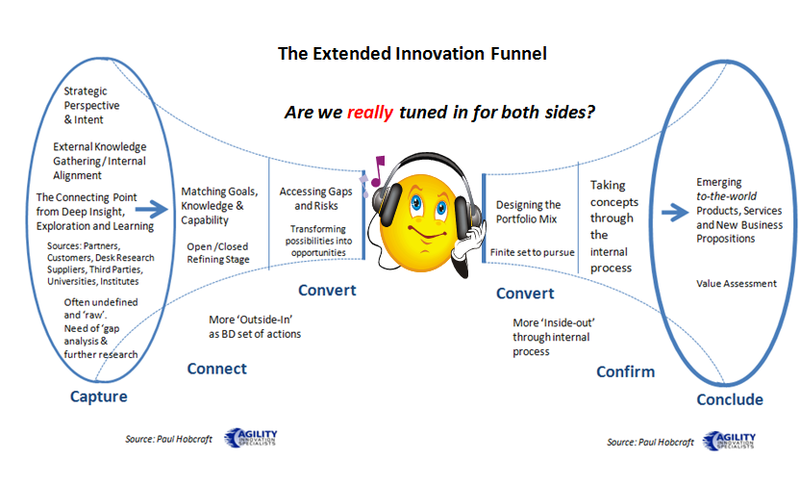 Lets listen to both sides of the innovation funnel, it can produce a better (re)sounding results. The more and earlier you know what kind of value your business is aiming to create, the better the eventual concepts entering the commercial end of the funnel will be. Then managing these in the most appropriate way given the context in which your business operates makes both ends of the funnel mutually important. This entry was posted in Sequencing and tagged building innovation capability, classic innovation, extended innovation funnel, idea management, innovation funnel, innovation process, the Idea to commercialization concept. Bookmark the permalink.